"Altis" redirects here. For other uses, see Altis (disambiguation). Olympia (Greek: Ὀλυμπία; Ancient Greek: [olympía]; Modern Greek: [oli(m)ˈbia] Olymbía), is a small town in Elis on the Peloponnese peninsula in Greece, famous for the nearby archaeological site of the same name, which was a major Panhellenic religious sanctuary of ancient Greece, where the ancient Olympic Games were held. The site was primarily dedicated to Zeus and drew visitors from all over the Greek world as one of a group of such "Panhellenic" centres which helped to build the identity of the ancient Greeks as a nation. Despite the name, it is nowhere near Mount Olympus in northern Greece, where the Twelve Olympians, the major deities of Ancient Greek religion, were believed to live. The Olympic Games were held every four years throughout Classical antiquity, from the 8th century BC to the 4th century AD. The archaeological site held over 70 significant buildings, and ruins of many of these survive, although the main Temple of Zeus survives only as stones on the ground. The site is a major tourist attraction, and has two museums, one devoted to the ancient and modern games. Olympia lies in the wide valley of the rather small Alfeiós River (also Romanized as Alpheus, Alpheios) in the western part of the Peloponnese, today around 18 kilometers away from the Ionian Sea, but in antiquity perhaps half that distance. The name Altis was derived from a corruption of the Elean word also meaning "the grove" because the area was wooded, olive and plane trees in particular. The Altis, as the sanctuary was originally known, was an irregular quadrangular area more than 200 yards (183 meters) on each side and walled except to the North where it was bounded by the Kronion (Mount Kronos). According to Pausanias there were over 70 temples in total, as well as treasuries, altars, statues, and other structures dedicated to many deities. Somewhat in contrast to Delphi, where a similar large collection of monuments were tightly packed within the tenemos boundary, Olympia sprawled beyond the boundary wall, especially in the areas devoted to the games. The Altis consists of a somewhat disordered arrangement of buildings, the most important of which are the Temple of Hera (or Heraion/Heraeum), the Temple of Zeus, the Pelopion, and the area of the great altar of Zeus, where the largest sacrifices were made. There was still a good deal of open or wooded areas inside the sanctuary. Olympia was also known for the gigantic chryselephantine (ivory and gold on a wooden frame) statue of Zeus that was the cult image in his temple, sculpted by Pheidias, which was named one of the Seven Wonders of the Ancient World by Antipater of Sidon. Very close to the Temple of Zeus which housed this statue, the studio of Pheidias was excavated in the 1950s. Evidence found there, such as sculptor's tools, corroborates this opinion. The ancient ruins sit north of the Alpheios River and south of Mount Kronos (named after the Greek deity Kronos). The Kladeos, a tributary of the Alpheios, flows around the area. 1. Northwest Propylon, 2. Prytaneion, 3. Philippeion, 4. Temple of Hera, 5. Pelopion, 6. Nymphaeum of Herodes Atticus, 7. Metroon, 8. Treasuries, 9. Crypt (arched way to the stadium), 10. Stadium, 11. Echo Stoa, 12. Building of Ptolemy II and Arsinoe II, 13. Hestia stoa, 14. Hellenistic building, 15. Temple of Zeus, 16. Altar of Zeus, 17. Ex-voto of Achaeans, 18. Ex-voto of Mikythos, 19. Nike of Paeonius, 20. Gymnasion, 21. Palaestra, 22. Theokoleon, 23. Heroon, 24. Pheidias' workshop and paleochristian basilica, 25. Baths of Kladeos, 26. Greek baths, 27. and 28. Hostels, 29. Leonidaion, 30. South baths, 31. Bouleuterion, 32. South stoa, 33. Villa of Nero. Treasuries. I. Sicyon, II. Syracuse, III. Epidamnus(? ), IV. Byzantium(? ), V. Sybaris(? ), VI. Cyrene(? ), VII. Unidentified, VIII. Altar(? ), IX. Selinunte, X. Metapontum, XI. Megara, XII. Gela. For a history of the Olympic Games, see Olympic Games or Ancient Olympic Games. It used to be thought that the site had been occupied since about 1500 BC, with a religious cult of Zeus developing around 1000 BC. It may be that instead there was only a sanctuary from the 9th or 8th centuries, though the question remains in debate. Others believe that remains of food and burnt offerings dating back to the 10th century BC give evidence of a long history of religious activity at the site. No buildings have survived from this earliest period of use. The first Olympic festival was organized on the site by the authorities of Elis in the 8th century BC – with tradition dating the first games at 776 BC. Major changes were made to the site around 700 BC, including levelling land and digging new wells. Elis' power diminished and the sanctuary fell into the hands of the Pisatans in 676 BC. The Pisatans organized the games until the late 7th century BC. The earliest evidence of building activity on the site dates from around 600 BC. At this time the Skiloudians, allies of the Pistans, built the Temple of Hera. The Treasuries and the Pelopion were built during the course of the 6th century BC. The secular structures and athletic arenas were also under construction during this period including the Bouleuterion. The first stadium was constructed around 560 BC, it consisted of just a simple track. The stadium was remodelled around 500 BC with sloping sides for spectators and shifted slightly to the east. Over the course of the 6th century BC a range of sports were added to the Olympic festival. In 580 BC, Elis, in alliance with Sparta, occupied Pisa and regained the control over the sanctuary. Silver Tetradrachm from Olympia, 360 BC. Obverse: Head of Zeus wearing laurel wreath. Reverse: Head of the nymph Olympia wearing sphendone. ΟΛΥΜΠΙΑ to right. The classical period, between the 5th and 4th centuries BC, was the golden age of the site at Olympia. A wide range of new religious and secular buildings and structures were constructed. The Temple of Zeus was built in the middle of the 5th century BC. Its size, scale and ornamentation was beyond anything previously constructed on the site. Further sporting facilities, including the final iteration of the stadium, and the hippodrome (for chariot-racing) were constructed. The Prytaneion was built at the northwest side of the site in 470 BC. Also, the Greek Baths were constructed in the middle of the 5th century BC. In the late classical period, further structures were added to the site. The Metroon was constructed near the Treasuries c.400 BC. The erection of the Echo Stoa, around 350 BC, separated off the sanctuary from the area of the games and stadium. The South Stoa was built at the southern edge of the sanctuary at approximately the same time. The late 4th century BC saw the erection of the Philippeion. Around 300 BC the largest building on the site, the Leonidaion, was constructed to house important visitors. Due to the increasing importance of the games, further athletic buildings were constructed including the Palaestra (3rd century BC), Gymnasion (2nd century BC) and bath houses (c.300 BC). Finally, in 200 BC, a vaulted archway was erected linking the entrance of the stadium to the sanctuary. During the Roman period, the games were opened up to all citizens of the Roman Empire. A programme of new buildings and extensive repairs, including to the Temple of Zeus, took place. In 150 AD, the Nympheum (or Exedra) was built. New baths replaced the older Greek examples in 100 AD and an aqueduct constructed in 160 AD. The 3rd century saw the site suffer heavy damage from a series of earthquakes. Invading tribes in 267 AD led to the centre of the site being fortified with material robbed from its monuments. Despite the destruction, the Olympic festival continued to be held at the site until the last Olympiad in 393 AD, after which the Christian emperor Theodosius I implemented a ban. The Temple of Zeus was apparently destroyed around 426 AD, during the persecution of pagans in the late Roman Empire, following an edict by Theodosius II enforcing the ban on pagan festivals. The workshop of Pheidias was turned into a Basilica and the site was inhabited by a Christian community. Archaeological evidence suggests that small scale Olympic events (possibly in Christian guise) were still being held secretly until Justinian's plague and two earthquakes devastated it by the mid-6th century. Repeated floods ensured that the settlement was finally abandoned altogether in the early 7th Century. Over time the site was buried under alluvial deposits, up to 8 metres deep, long thought to be the result of river flooding. Modern research hypothesizes instead—based on the presence of mollusc and gastropod shells and foraminifera— that the site was buried by ocean waters resulting from repeated tsunamis. The exact site was re-discovered in 1766 by the English antiquarian Richard Chandler. The first excavation of the sanctuary at Olympia was not carried out until 1829, by the French "Expedition Scientifique de Moree". Since the 1870s, the excavation and preservation of Ancient Olympia has been the responsibility of the German Archaeological Institute at Athens. The first major excavation of Olympia began in 1875, funded by the German government after negotiation of exclusive access by Ernst Curtius. Other archaeologists responsible for the dig were Gustav Hirschfeld, George Treu, Adolf Furtwängler (who worked alongside architects), A. Boetticher, Wilhelm Dörpfeld, and Richard Borrmann. They excavated the central part of the sanctuary including the Temple of Zeus, Temple of Hera, Metroon, Bouleuterion, Philipeion, Echo Stoa, Treasuries and Palaestra. Important finds included sculptures from the Temple of Zeus, the Nike of Paeonius, the Hermes of Praxiteles and many bronzes. In total 14,000 objects were recorded. The finds were displayed in a museum on the site. Excavation was continued in a more limited way by Dörpfeld between 1908 and 1929 but a new systematic excavation was begun in 1936 on the occasion of the 1936 Summer Olympics in Berlin under Emil Kunze and Hans Schleif. Their excavation focus was on the area to the south of the stadium, the South Stoa, bath complex and gymnasion. Between 1952 and 1966, Kunze and Schleil continued the excavation joined by architect Alfred Mallwitz. They excavated Pheidias' workshop, the Leonidaion and the north wall of the stadium. They also excavated the southeast section of the sanctuary and out of approximately 140 debris pits found many bronze and ceramic objects along with terracotta roof tiles. Mallwitz took charge of the excavations between 1972 and 1984 revealing important dating evidence for the stadium, graves, and the location of the Prytaneion. From 1984 to 1996, Helmut Kyrieleis took over the site and the focus shifted to the earlier history of the sanctuary with excavation of the Prytaneion and Pelopion. The Olympic flame of the modern-day Olympic Games is lit by reflection of sunlight in a parabolic mirror in front of the Temple of Hera and then transported by a torch to the place where the games are held. When the modern Olympics came to Athens in 2004, the men's and women's shot put competition was held at the restored Olympia stadium. The town has a train station and is the easternmost terminus of the line of Olympia-Pyrgos (Ilia). The train station with the freight yard to its west is located about 300 m east of the town centre. It is linked by GR-74, and the new road was opened in the 1980s; the next stretch N and NE of Olympia opened in 2005. 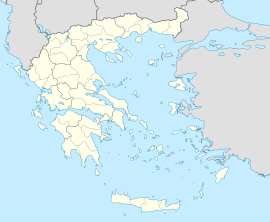 The distance from Pyrgos is 20 km (12 mi), about 50 km (31 mi) SW of Lampeia, W of Tripoli and Arcadia and 4 km (2 mi) north of Krestena and N of Kyparissia and Messenia. The highway passes north of the ancient ruins. A reservoir is located 2 km (1 mi) southwest, damming up the Alfeios River. The area is hilly and mountainous; most of the area within Olympia is forested. Panagiotis Kondylis, one of the most prominent modern Greek thinkers and philosophers, was born and raised in Olympia. When Pierre de Coubertin, the founder of the International Olympic Committee, died in 1937, a monument to him was erected at ancient Olympia. Emulating Evangelis Zappas, whose head is buried under a statue in front of the Zappeion, his heart was buried at the monument. The site and town of Olympia were severely threatened and nearly damaged by the 2007 forest fires. Architectural model of the enclosure of the sanctuary of Olympia, Greece. Crypt of Olympia commemorative coin. The municipality has an area of 545.121 km2, the municipal unit 178.944 km2. Buildings and monuments in Olympia have been selected numerous times as main motif of collectors' coins. One of the recent samples is the €100 Greek Crypt of Olympia commemorative coin, minted in 2003 to commemorate the 2004 Summer Olympics. In the obverse of the coin, the Crypt of Olympia is depicted. The crypt is a long and narrow vaulted passage through which the athletes and judges entered the Stadium, signifying the opening of the games. ^ Bickerman, E. J. (1982). Chronology of the ancient world (2nd ed., 2nd print. ed.). Ithaca, N.Y.: Cornell Univ. Press. p. 75. ISBN 0-8014-1282-X. ^ a b "Olympia Hypothesis: Tsunamis Buried the Cult Site On the Peloponnese". Science Daily. July 11, 2011. Retrieved 12 July 2011. ^ a b c "Olympics Through Time". sunsite.icm.edu.pl. ^ a b "Olympics Through Time". sunsite.icm.edu.pl. ^ "Olympics Through Time". sunsite.icm.edu.pl. ^ Sherry Marker, "Where Athletes Once Ran" Archived 2007-11-03 at the Wayback Machine in the New York Times, July 18, 2004. ^ Gates, Charles (2003). Ancient cities: the archaeology of urban life in the Ancient Near East and Egypt, Greece and Rome. Psychology Press. p. 234. ^ "Ancient and modern Shot put revisits Olympia". the Guardian. 19 August 2004. ^ a b c "Twinnings" (PDF). Athens: Central Union of Municipalities & Communities of Greece. Retrieved 2015-06-16. Wikimedia Commons has media related to Olympia.